When it comes to charitable donations, several Region organizations can say every cent given does matter. Just ask Steve Beekman, executive director of the Food Bank of Northwest Indiana. In a decade’s time, more than $899,448 has been raised for his organization through Strack & Van Til’s Round Up program. Customers are asked, when they are paying for purchases, if they want to round up their total to the next dollar with the extra funds going to charity. “You can equate every $1 of that amount raised to equal about three meals, which allows us to serve what results in 2.7 million meals in total in these last 10 years we’ve received the funds from Strack & Van Til’s Round Up campaign,” Beekman said. This form of charitable contribution also is referred to as point-of-purchase fundraising, and it’s been successful around the country. Research from Engage for Good published the study “America’s Checkout-Charity Champions,” examining 2014 data—the most current available—and it reported more than $390 million was raised in 2014 by 77 major campaigns of $1 million-plus or more. CEO Jeff Strack and Chief Operating Officer Dave Wilkinson of Highland-based Strack & Van Til grocery store chain and parent company Indiana Grocery Group are proud of their customers’ coin commitment. Coordinated by Fran King, who is the executive assistant to Strack and Wilkinson, the company’s cash register “roundup” program has generated millions of dollars in money donations during the last decade for numerous charities around Northwest Indiana. The concept is simple and proven effective for a variety of causes during selected weeks throughout the year. When a charity organization is chosen for either a scheduled one- or two-week span, cashiers at the checkout ask customers if they “would like to round up their total due to the next dollar to help support” a spotlight charity. There are no administrative fees, and since the “roundup” happens after the grocery order is totaled with taxes, that donation amount is not included in the true grocery bill, and therefore not taxed. “We’ve been doing the roundup program for a decade, and it’s grown every year in both dollar amounts and in the number of requests we receive from local groups who want to benefit,” said King, who has worked at Strack & Van Til’s headquarters for 12 years. 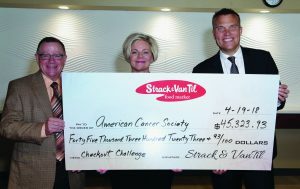 Beekman said his organization is fortunate to have maintained its annual roundup campaign tradition with Strack & Van Til. It typically takes place in November and December. King said customer support for the program always is strong. “We always want to make sure we are selecting charity organizations that are from our communities our stores serve and which make sense to benefit from this opportunity,” King said. King said Strack & Van Til strives to assist a mix of charities annually. Habitat for Humanity, Trade Winds, the Humane Society and the American Cancer Society are among the many organizations that have benefited from the Strack & Van Til Round Up program. Kevin Feldman, director of development for The Salvation Army Lake County, said that during the designated last two weeks of July 2018, his organization netted more than $19,000 from Strack & Van Til’s Round Up program. “The company’s leaders and employees care about people, plain and simple. Words aren’t enough to express our gratefulness for the generosity of Strack & Van Til,” Feldman said. King said the 2019 calendar year already is filled with charity organizations chosen to benefit from this year’s roundup program. “The other important component for this program is our cashiers who extend the invitation to our customers to make a donation,” King said. King said a little incentive helps too. “During a roundup campaign, quite often the cashier whose checkout has raised the most funds are rewarded by the charity organization who might donate a T-shirt for them or gift card,” she said. Lisa Daugherty, president and CEO for Lake Area United Way, said her organization benefited from the Strack & Van Til Round Up program in 2016, 2017 and has been invited to have a designated week in 2019.